It contains all of the essential components required to start programming with the Elegoo Uno R3 board, and a free pdf tutorial featuring 33 different lessons for beginner and professional users. 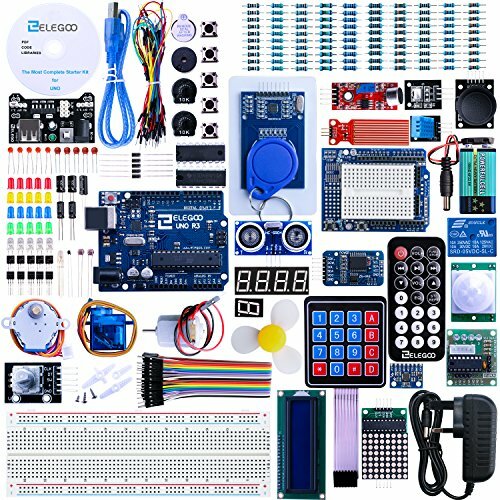 The most complete, biggest and highest cost performance starter kit with 63 kinds of arduino products, more than 200pcs components. Nice package with clear listing and surprise including a nice small box to keep the widget such as LED, IC, buttons, diodes, etc. Warning Tip:The input voltage of Elegoo Power Supply Module is 6.5v - 9v (DC) via 5.5mm x 2.1mm plug. Please DO NOT over charge it otherwise it will burn your board and chips.